Why Should I Bother Making A Personal Injury Claim? Forget rumours of ‘compensation culture’, whilst there has been an increase in individuals claiming following personal injury, many sufferers are still not demanding the compensation they deserve after an accident. If you have recently been affected by an injury at work, following a road collision or because of a slip or fall in public, you may be eligible to claim. Plus, these are just a handful of the most common reasons for claiming. There really there is no end to the scenarios that are eligible. If your health has been damaged through the negligence of somebody else, there could be financial compensation available. I am delighted with the outcome of my claim and can’t thank you enough for all the hard work that you put in. Everything went so smoothly and all I had to do was sign some papers and everything was taken care of. Anytime I had any concerns I knew I could call and my mind was always put at rest. You can never know how much this means to me and I am so grateful. If anything ever happened to me again then I would come straight to you. One of the biggest misconceptions held by those who have suffered a personal injury, is that it’s simply not worth the stress to make a compensation claim. We understand that after the trauma of an accident that leaves you temporarily or permanently handicapped, the last thing you want is to be party to lengthy court cases or dealing with complicated paperwork. With First Personal Injury, this won’t be the case. Our team of professional personal injury lawyers will do all the hard work for you. We’ll keep you up-to-date with the entire injury claims process, so you can get on with your life and focus on your recovery. All you need to be able to provide is as much proof as possible that someone else is liable for your injury, as well as any proof of expenses incurred due to your illness or injury. Think it will take forever to get the ball rolling with a compensation claim? Think again. Getting started with a compensation claim only takes a matter of minutes. Start by giving us a call, for free, to discuss your situation and detail exactly what happened and what injury you (or your child or loved one) sustained. We can inform you whether we think you will have a chance of successfully securing compensation and can then take all the information we need to start the accident claims process. You never even need to set foot in our offices, all communication can be done over the phone or via e-mail – whatever works best for you. We realise that you may still be housebound or even bed-ridden following your accident so we are keen to make it as easy as possible for you to claim without leaving your home. Afraid of making a case against your employer, local supermarket or even a member of your family? If you’ve been involved in an accident, fortunately, there should be insurance in place to protect you and the other party for this unforeseen event. Employers must be insured to cover accidents in the workplace, while your local supermarket will have public liability insurance in the event of accident claims. This means the finances are already in place to cover your compensation and the opposing party should not be left out of pocket, something that can put your mind at rest when making a claim against someone you are loyal too. Compensation claims should not be seen as an attack against the person liable, but a simple way of making sure that you are compensated for the inconvenience and loss of income suffered due to any personal injury accident. It’s surprising how costs can add up when you find yourself off work due to injury. Suddenly you are paying out on everyday living expenses instead of earning more, and there may be financial outlays that were being previously covered by your employers outside of your salary – such as transport and phone bill. Compensation not only provides finances just for the inconvenience of your injury but will cover any financial losses such as reduction in salary and costs of prescriptions, treatment and travel etc. If you feel a sense of emotional turmoil following a personal injury, financial compensation can help bring a sense of closure to the event. Of course, money is not going to heal your wounds or rewind time, but compensation can be put towards a brighter future. By claiming compensation, you may feel you are holding the responsible party to account for your injury. Another common reason for injured parties not claiming the compensation they deserve is the idea of having to pay out following an already costly ordeal. This is not the case. 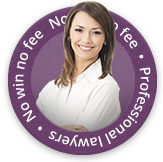 With a ‘no win, no fee’ claims process. Your personal injury lawyer can explain more about any charges which may be made should you win your case. Whether your claim relates to an accident at work, medical negligence, car accidents or other types of claims, contact our team to find out whether we can help.